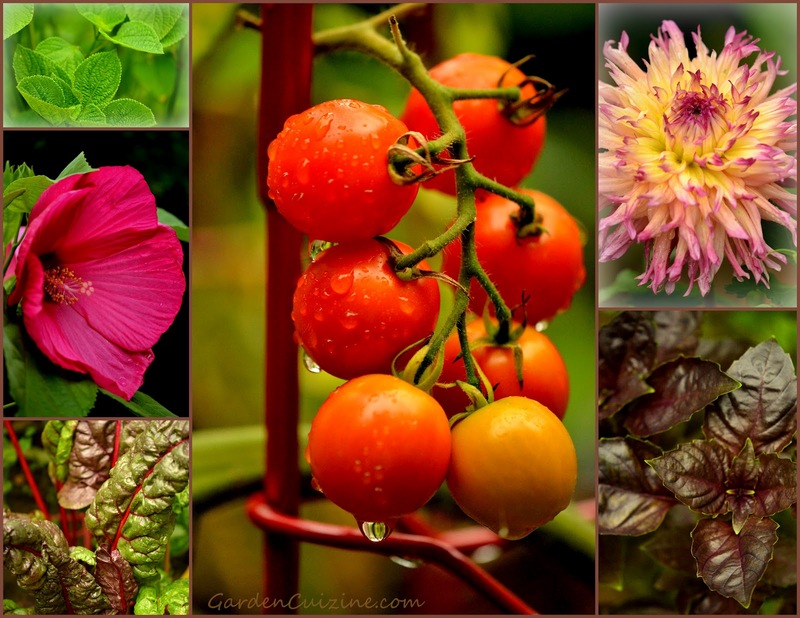 In addition to several varieties of heirloom tomatoes growing well with fruits that are still green (see photo posted on twitter @GardenCuizine this morning), our kitchen garden features colorful flowers and fruits, vegetables, whole grains, seeds and many varieties of herbs. We are especially thankful for some recent and much needed rain! Tarahumara Chia (Salvia tiliifolia), which naturalized in one of our raised beds. It's thriving and expected to bloom in August. Of all our tomatoes, the cherry tomatoes are ripening first. All plants were started indoors from seed saved from the previous year, using the fermentation process. Dahlias are blooming now too. Our dahlias are special to me because all of our tubers came from my late cousin, whom I greatly miss. He was a master dahlia grower and surely would NOT be happy with the size of our blooms. They are not dinner plate in size, because we didn't divide the tubers; but they are still beautiful and make a lovely addition to cut flower arrangements. All varieties of Italian basil appear ready to harvest and have been beginning to bloom. When it becomes impossible to keep up with pinching off the bloom buds, we know it is time to process the leaves into pesto. We'll probably process some next weekend. We are still harvesting Swiss Chard Northern Lights Mix. Swiss Chard can take the heat and produces all summer long. Our Chard was grown from seeds that were directly sown in early spring. Perennial, 4 to 6 foot hardy hibiscus (Hibiscus moscheutos) are blooming now and are gorgeous. We have blooms in shades of pink and white. Today in Our Garden spotlights a mere sampling of what is in bloom at the present time. Of course, we have many other plantings in bloom too. Hope you enjoyed the brief garden tour. Photo collage Copyright (C)2012 Wind. All rights reserved.